A little boy dressed in his pyjamas is scolded by his mum as he is still playing with the train on the floor at the end of his bed. He is told to go to bed at once, and mum gives him his pyjama-case dog to cuddle. There’s no goodnight kiss, however, just an order to “settle down and go to sleep”. The boy obeys. The next two pages show a double-spread of the toy train chugging off, with smoke billowing out of the engine’s chimney. Turn over again, and the boy is seated in the engine, wearing his pyjamas and a cap. The dog, also sporting a cap, is shovelling coal into the furnace. The train speeds along over great bridges, puffing out grey smoke, and the boy thinks they might have time for a picnic. Then he notices that it looks as though it’s foggy ahead and says they could play ghosts if it is. Suddenly, an elephant boards the train, but the boy and the dog say in no uncertain terms, “Oi! Get off our train.” The elephant, however, very politely begs to be allowed to stay on the train as someone wants to cut off his tusks, and soon there will be no elephants left. He stays on and sprays the dog with a huge jet of water when they stop for a swim. It looks like great fun. After this several other animals try to board the train: a seal, a crane, a tiger and a polar bear. Each one is initially told “Oi! Get off our train.” But each animal has a reason to stay: too many fish are being caught, forests are being cut down, marshes are being drained. Lots of fun is had during the journey, flying kites, throwing snowballs, and messing about with umbrellas. Suddenly the boy realises that they will have to head home so that he will be in time for school in the morning. We see him tucked up in bed and mum comes to tell him to get up straight away. It must have been a dream, or was it? Mum says there are animals all over the house: a seal in the bath, an elephant in the hall, and so on. She wonders if it has anything to do with the boy. ‘Oi! Get off our Train‘ is a delightful story in which John Burningham cleverly brings in the message that these animals are all endangered species. It is an original way of combining an imaginative tale of a boy and a toy dog speeding off on an adventure with the idea that the animals need help because their numbers are dwindling. Burningham makes sure that there is plenty of play and fun throughout so that the story will have sufficient appeal for a young child. This is an easy book to read aloud with the text in a clear, large font and just a few lines – sometimes only one – on each double page. Although the vocabulary used is straightforward, I wouldn’t recommend it as a book for a very young child who is learning to read by phonics. It could, however, be popular with children up to the age of seven who are independent readers and might enjoy reading the story aloud to a younger sibling. 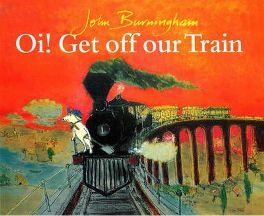 John Burningham illustrates his picture books himself, and the illustrations contribute enormously to ‘Oi! Get off our Train’. They are watercolour/pastel sketches that use a great variety of colours to create different moods, from the sun-filled scene of kite-flying to the black and gold sky of the double page that shows the train steaming home again. The animals take on human qualities as they stand upright, either to tell the latest arrival to get off the train or to hold up umbrellas. At one point we see the dog taking a break from shovelling coal: he has removed his cap and is mopping his brow with spotted red handkerchief. Burningham is one of my favourite illustrators, but I know there are those who prefer the more up-to-date work of, for example, Arthur Robins or Lauren Child. I have successfully used ‘Oi! Get off our Train‘ in drama sessions with small groups of four-year-old children. I thought the title might be considered rude and I’m expected to be teaching these little ones how to be polite, so I suggested we say ‘Hey! Get off out train, please’ as an alternative. The story does lend itself well to drama as most children enjoy pretending to be animals as well as chugging round the room making steam train noises. If there are too many children in the group there is no harm in having two elephants, two seals, and so on. To be honest I’m not quite sure how well they understood the idea that the animals were endangered species, but if you are reading the book aloud to just one or two children it might be easier to emphasise this and talk more about it. ‘Oi! Get off our Train‘ may appeal slightly more to boys than girls, as the main character is a boy and boys are perhaps more likely to be interested in trains. It is, however, a delightful story, and the animals and sense of adventure should make it a book that any child will enjoy. For anyone interested in explaining the idea of endangered species to young children, this book is an ideal way of approaching the subject since it weaves the message into a story. I would highly recommend it. No Comments on "Oi! Get Off our Train"